Every Valentines day morning my mom would set out a special gift for us on the kitchen table. I wanted to keep her tradition with my children, expect with a yummy twist. 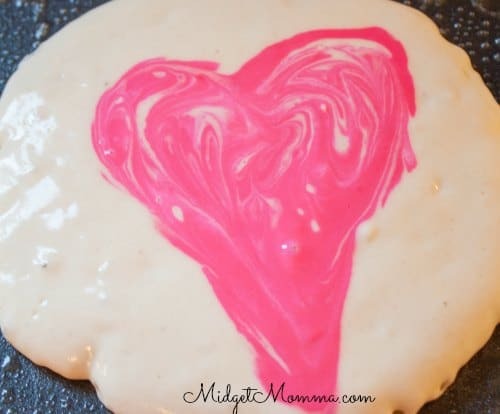 I want to make my daughter favorite meal with some sort of love theme. 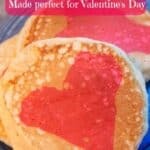 These heart pancakes can be custom to each of your children favorite color. Preheat the griddle or pan over medium heat. In a medium bowl, whisk together the flour, baking powder and salt. Whisk in the milk, egg and oil, just until the batter has combined. Place a third of the batter into a separate bowl and add a few drops of your food coloring, stir to combine. Pour the colored batter into a ziptop bag and cut a small hole on the bottom corner of the bag. Grease the pan with butter. Pour about 1/3 cup of the plain pancake batter on the pan. 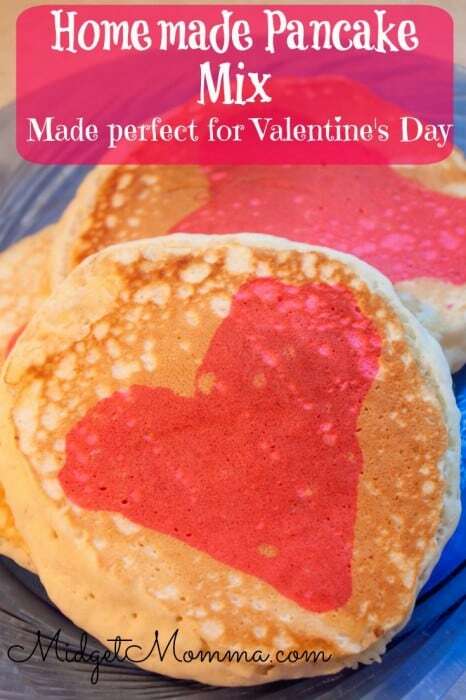 With your ziptop bag draw a heart on top of the pancake. Cook the pancake 2 to 3 minutes, or until the bubbles begin popping on top of the pancake and it’s golden brown on the bottom. Flip the pancake over. Cook an additional 2 to 3 minutes, until the other side is golden as well.